I am preparing to my ATPL theory exams now, and, of course, I am making records. Here I will put some of them, probably somebody will find it helpful. IFR Communication – 24 questions, 30 minutes. Each one has some difficulties, but some of them became my personal nightmares. For example, Air Law, Operation Procedures and General Navigation. The first two did because of huge amount of information to memorize, and the latter is because of timing: a lot of computations with only about 2 minutes per question. A lot of subjects require mainly knowledge. The only way to pass is reading the books. But some of them, for example, navigation, allows to solve a huge part of questions only by knowing a proper method. That’s why I decided to start this page with navigation problems. I did not do it in scale, but it does not matter for computation. We have our final track α (black angle around A, 85°). 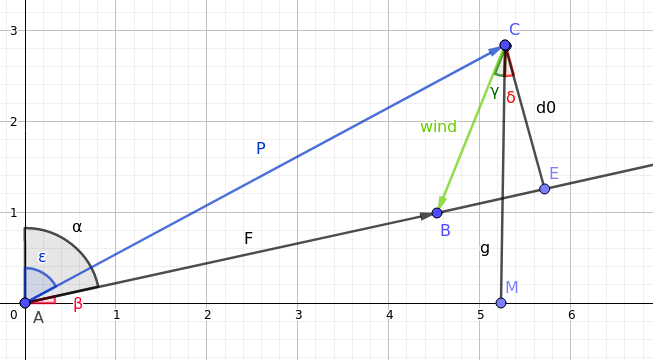 Wind angle is γ (green angle around point C, 30°), and wind speed is CB (green arrow). We also know AC (470 knots, it’s our speed vector without wind correction). We have to find AB (final speed value after wind correction) and ε, angle between AC and vertical axis (which is our required HDG). We can see that δ = β = 90° – 85° = 5° (CM ⊥ AM, CE ⊥ AE so δ = β). Flight time is dist / speed = 265 / 405 = 0.654 h = 39 minutes.